No less than United States President Barack Obama tweeted an invite to 14-year-old Ahmed Mohamed after he was a******d and interrogated by officers for bringing what appeared to be a bomb inside his school in Irving, Texas, USA Today reported. The bomb, as it turned out, was a harmless homemade clock he had made for a project. 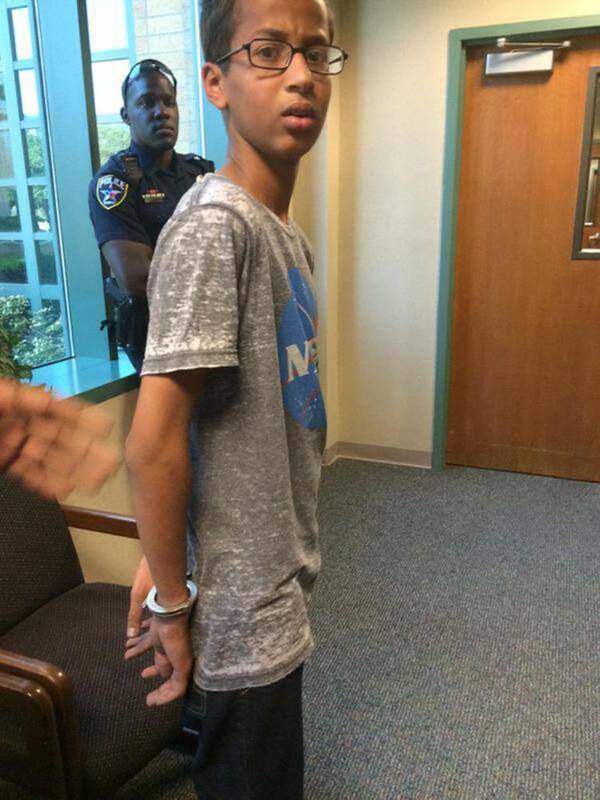 However, pictures of the young Muslim teenager—a self-confessed tinkerer of gadgets and electronics who dreams of becoming an inventor—being led away in handcuffs while wearing a NASA shirt has sparked anger and accusations of Islamophobia against the school and police. Making the backlash even worse in the aftermath was the refusal of school and police officials and city mayor Beth Van to apologize for the arrest. According to them, they were just following protocol for bomb threats. Nevertheless, several personalities aside from Obama and scientists have come to Mohamad’s aid, with many of them praising him for his ingenuity and creativeness. Not to be outdone, Google also extended an invitation to the youngster. “Hey Ahmed—we’re saving a seat for you at this weekend’s Google Science Fair…want to come? Bring your clock!” the tech giant tweeted. Other companies like Twitter, Foursquare, and the school where Mohamad said he plans to go someday—MIT—have also expressed their wish for the budding young inventor to visit them. Mohamad’s family said they are thankful for the outpouring of support. “Thank you fellow supporters. We can band together to stop this racial inequality and prevent this from happening again,” they wrote.